New Zealand’s own Ryan Sissons and Tony Dodds finished one-two at the ITU Oceania Sprint Triathlon Championships in Kinloch on Saturday, while counterpart Sophie Corbidge won the women’s title. 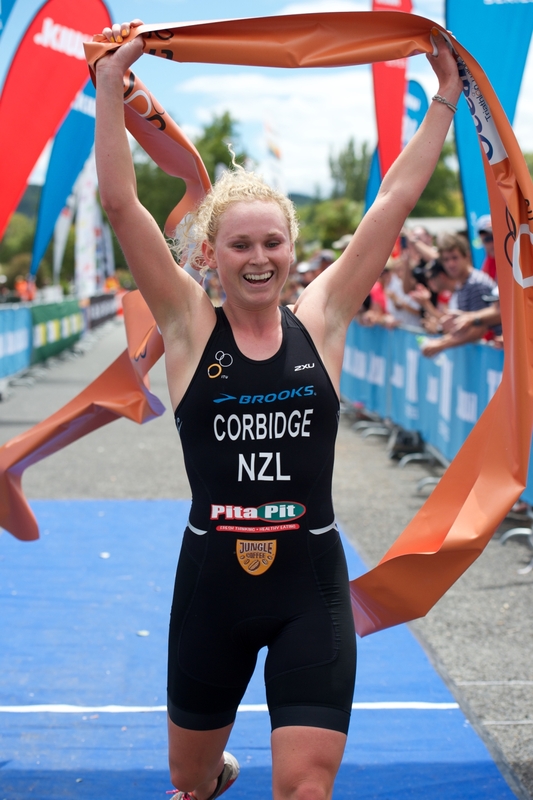 The .kiwi Tri Series race doubled as the New Zealand championships. In the men’s race, Dodds led out of the water but it was Tom Davison who shook up the field on the bike, passing Dodds and teenager Tayler Reid to establish a one minute lead going into the run. Davison is cycling superbly on the back of his third place finish at the recent New Zealand road cycling nationals and showed great strength and form again today before fading on the run leg. Sissons though paced his effort exceptionally, taking the lead with Dodds by his side with 2.5km to run and then easing clear in the closing stages. Australia’s Brandon Sexton took bronze behind the two Kiwis in 1:02:28. In the women’s race, Corbidge raced superbly to ride away from the field on the bike, establishing a gap that could not be bridged by Canada’s Ellen Pennock over the 5km run, with Fiona Crombie (NZL) posting a strong run to grab the final place on the podium. The swim did little to separate the field with the favourites emerging from the water in close contact but once on to the bike a lead group of seven quickly established themselves on the back of their strong hill work and bike handling skills. Corbidge was driving the train, with a host of emerging New Zealand talent for company also riding with the leaders, as Pennock was the only international to foot it with the Kiwis. Corbidge made her move at the midway point on the bike, surging clear on the downhill back into Kinloch, showing great strength and a tactical awareness beyond her years. She exited on to the 5km run with a 28 second lead over the chasers, with Pennock quick out of transition and off in pursuit of the Kiwi. Her run was to fall short though, with Corbidge coming home 4 seconds clear of the Canadian 21 year old with Crombie posting the quickest run split of the day to grab a spot on the podium.